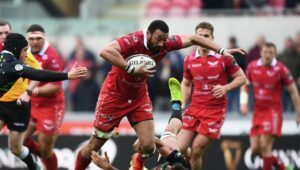 In a 10-try thriller, where both sides scored five, it was league leaders Toulouse who came out on top thanks to a decisive 77th-minute try from Sofiane Guitone. The victory allowed Toulouse to open up an eight-point lead on the table over their opponents, with four rounds left before the playoffs. Toulouse took an initial lead through Guitone’s first try. Thomas Ramos and Clermont’s Greig Laidlaw then traded three penalties, with Clermont levelling matters at 16-16 just before the break through a try from Damian Penaud. An action-packed second half, which saw three yellow cards, then ensued. 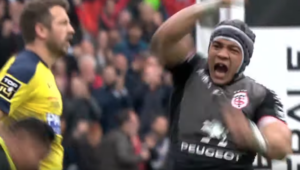 Toulouse opened up a 33-23 lead on the hour mark thanks to converted tries from Cheslin Kolbe and Richie Gray, only for Clermont to storm ahead through a 21-point blitz as Penaud scored a quickfire double to round off his hat-trick before a penalty try. However, Romain Ntamack touched down to narrow the gap before Guitone went over for his second, importantly converted by Ramos, to clinch the match for Toulouse. Earlier in the day, an equally dramatic game saw Montpellier’s hopes of finishing in the top six take a blow after suffering a 26-25 loss to Racing 92, who remain in fourth place. Montpellier opened up a 12-6 lead in the first half thanks to tries from Jan Serfontein and Benoit Paillaugue, but Racing were able to go into the break one-point ahead as Maxime Medard kicked two penalties and Baptiste Chouzenoux scored in half-time stoppage time. 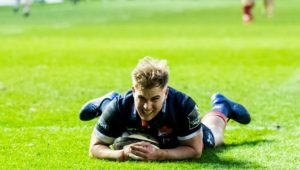 Paillaugue’s second try had put ninth-placed Montpellier in front, but they had Jacques du Plessis sent to the sin bin and were unable to hold on while down to 14 men, as Racing stole the win through a 77th-minute try from Henry Chavancy. In other results, Lyon stayed in third place on the log, three points above Racing, after thrashing lowly Perpignan 47-9, while La Rochelle boosted their playoff hopes by going level with sixth-placed Bordeaux with a 71-21 demolition of Pau. 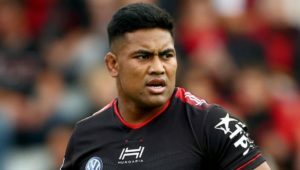 Defending champions Castres claimed a 16-12 win over Bordeaux, Stade Français beat Agen 25-22, while Toulon were brought crashing back to earth by a 19-18 loss to Grenoble.